Dr. Gerber: In this trial, we compared an immunotherapy and a chemotherapy drug in patients with non-squamous non-small cell lung cancer (NSCLC) whose disease continued to progress after first-line chemotherapy. We found that nivolumab immunotherapy improved overall survival compared to docetaxel chemotherapy and was generally well tolerated. These results are significant because options for patients whose lung cancer progresses after initial treatment are limited. Nivolumab is an immunotherapy drug that works by inhibiting the cellular pathway known as PD-1 protein on cells that block the body’s immune system from attacking cancerous cells. The idea behind nivolumab and other immunotherapy drugs is to kick-start the body’s natural immune response to a cancer. Cancer develops and grows in part because it has put the brakes on the immune response. These drugs take the foot off the brake, allowing the immune system to accelerate and attack the cancer. The phase 3 clinical trial followed more than 500 patients who had non-squamous non-small cell lung cancer (NSCLC): 287 received nivolumab and 268 received the chemotherapy drug docetaxel. The one-year survival rate was 51 percent in the nivolumab arm versus 39 percent in the docetaxel arm. The most common reported side effects with nivolumab were fatigue, nausea, decreased appetite, and weakness, and they were less severe than with docetaxel treatment. In a minority of cases, patients treated with nivolumab also developed autoimmune toxicities affecting various organs. In addition to studying safety and efficacy, the trial examined the protein biomarker PD-L1, which is believed to play a role in suppressing the immune system. The study results suggested that patients with a higher level of PD-L1 in their cancers may experience the greatest benefit from nivolumab, which targets the related molecule PD1. Using a biomarker helps oncologists predict which patients will do best on which treatment, and plan their treatment accordingly. Other promising predictive biomarkers for cancer immunotherapies include the degree of immune cell infiltration within a tumor and the number of mutations a tumor has. Specifically, the more mutations a cancer has, the more foreign it appears to the body, thus marking it for immune attack. With lung cancer, we see the greatest number of tumor mutations – and perhaps the greatest benefit from immunotherapy – among individuals with the heaviest smoking history. 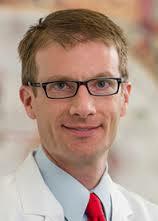 Dr. Gerber: This clinical trial shows that people with lung cancer not only live longer when treated with the immunotherapy drug nivolumab, but their quality of life is better and toxicities are fewer and less severe. Other types of cancer have also shown benefit from nivolumab and other immunotherapies, including melanoma, some lymphomas, some colon cancers, ovarian cancer, bladder cancer, and more. Currently, the immune checkpoint inhibitor drugs nivolumab and pembrolizumab are FDA approved for lung cancer and melanoma. Another immune checkpoint inhibitor, ipilimumab, is approved for melanoma. The advent of these and other immunotherapies is arguably among the greatest advances in medical cancer treatments in the last 30 years. Nevertheless, clinicians using these drugs must remain vigilant to the possibility of autoimmune adverse effects in a minority of patients, which can target almost any organ in the body. It is important to recognize these conditions and initiate treatment early on. Dr. Gerber: Future research directions are likely to include combinations of immunotherapy drugs with one another, with chemotherapy drugs, and with molecularly targeted therapies. Combination with other treatment modalities such as radiation therapy are also under consideration. Work to refine predictive biomarkers to help identify which patients are mostly likely to benefit is underway, as are studies designed to predict which patients will develop autoimmune toxicities and when. Finally, now that we have seen the efficacy of these drugs in patients with advanced cancers, expect to see future studies examining their effects in patients with early-stage tumors. Hossein Borghaei, D.O., Luis Paz-Ares, M.D., Leora Horn, M.D., David R. Spigel, M.D., Martin Steins, M.D., Ph.D., Neal E. Ready, M.D., Ph.D., Laura Q. Chow, M.D., Everett E. Vokes, M.D., Enriqueta Felip, M.D., Esther Holgado, M.D., Fabrice Barlesi, M.D., Ph.D., Martin Kohlhäufl, M.D., Ph.D., Oscar Arrieta, M.D., Marco Angelo Burgio, M.D., Jérôme Fayette, M.D., Ph.D., Hervé Lena, M.D., Elena Poddubskaya, M.D., David E. Gerber, M.D., Scott N. Gettinger, M.D., Charles M. Rudin, M.D., Ph.D., Naiyer Rizvi, M.D., Lucio Crinò, M.D., George R. Blumenschein, Jr., M.D., Scott J. Antonia, M.D., Ph.D., Cécile Dorange, M.S., Christopher T. Harbison, Ph.D., Friedrich Graf Finckenstein, M.D., and Julie R. Brahmer, M.D. This entry was posted in Author Interviews, Chemotherapy, Lung Cancer, NEJM, UT Southwestern and tagged immunotherapy, lung cancer by Marie Benz MD FAAD. Bookmark the permalink. Any likely implications for sclc?